On what date did Henrietta Lacks first go to Johns Hopkins to have the knot in her womb examined? How old was Henrietta Lacks when she became pregnant with her fifth child? Who were Henrietta's cousins that she first told about the knot she felt in her womb, prior to her visit to the hospital? Henrietta Lacks died from lung cancer. Henrietta Lacks went to the hosptial for medical treatment. Why did Henrietta Lacks to the Hospital for treatment and What was the name of the Hospital? Who was the gynecologist that examined Henrietta Lacks when she first went to Johns Hopkins Hospital to have the knot in her womb see ? What was Henrietta Lacks's name at birth ? ANALYSIS: WHAT'S UP WITH THE TITLE? Skloot's title intends to make us think about what Henrietta's immortality really means—for her, for her family, and for the scientific community. It's clear from the book that "immortality" means something different to each group involved in Henrietta's story. For the scientific community, it means everlasting cell life. But her family knows that behind the science lies a real person. And that person suffered and left behind a family, the legacy of her heart as well as her genes. 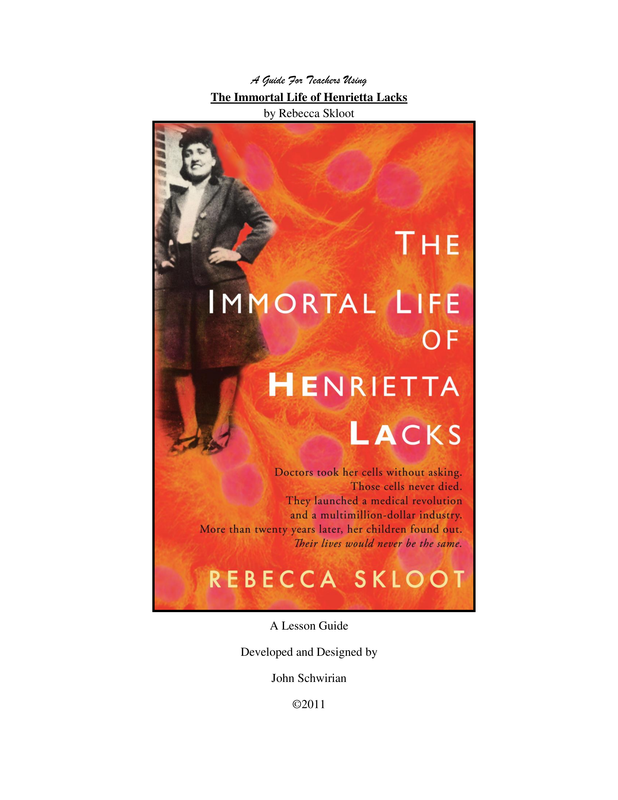 In this title, Skloot challenges us to think about which version we value most: Henrietta Lacks or HeLa? ANALYSIS: WHAT'S UP WITH THE EPIGRAPH? Elie Wiesel is a Holocaust survivor and recipient of the Nobel Peace Prize. His best-known work, Night, is a memoir of his survival in Nazi concentration camps. Skloot's epigraph comes from Wiesel's forward to a collection of papers on medical ethics (or lack thereof) of Nazi doctors and scientists. Skloot has in mind the treatment of the Lacks family by most of the scientific community, who could never get why they might be upset by the creation and distribution of HeLa cells. Wiesel sums up this kind of thinking best: "Their sense of reality was impaired. Human beings were not human beings in their eyes. They were abstractions." (ix). State your point of view. 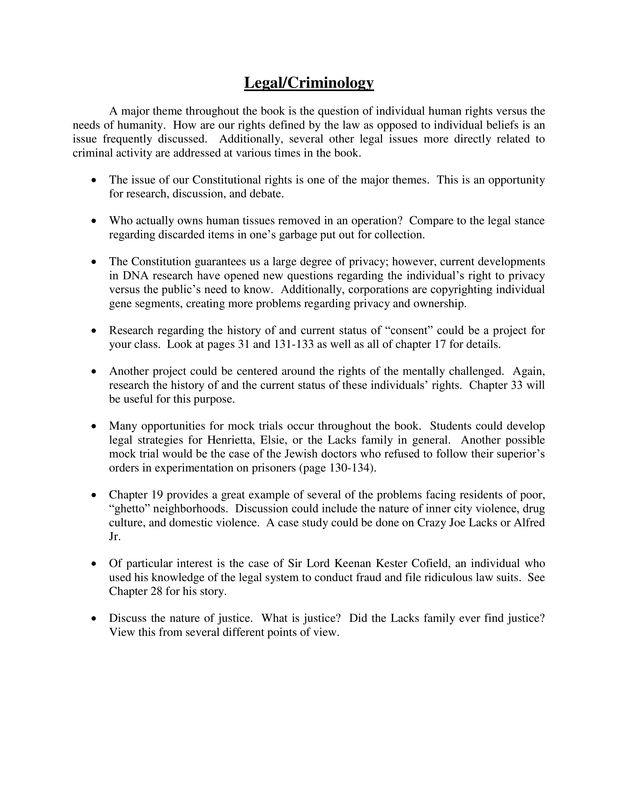 Do you beleive the Lacks family has been treated justly? What would you have done? How is Henrietta Lacks's early childhood described in the book? When and where was she born? Where did she grow up? 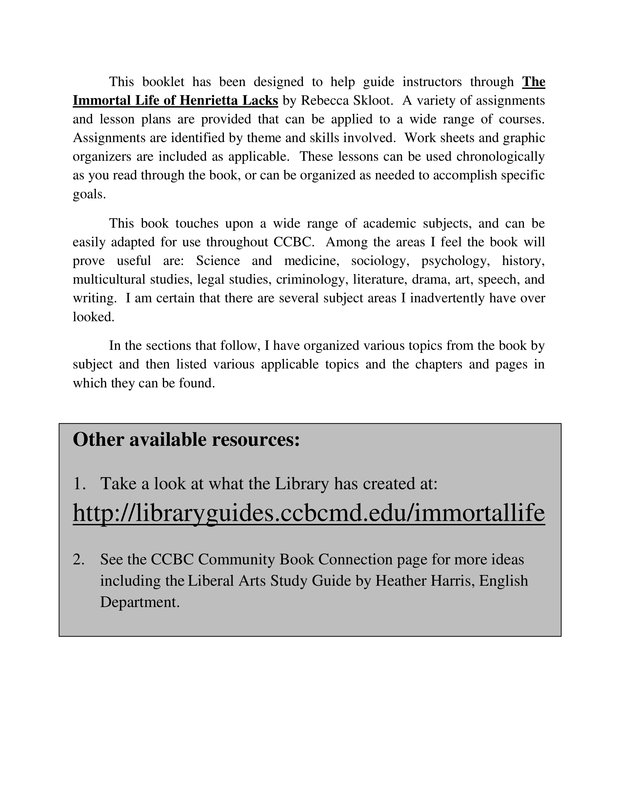 Describe the genre and narrative style of The Immortal Life of Henrietta Lacks. From whose perspective is the narrative related? Examine the theme of poverty in the narrative. 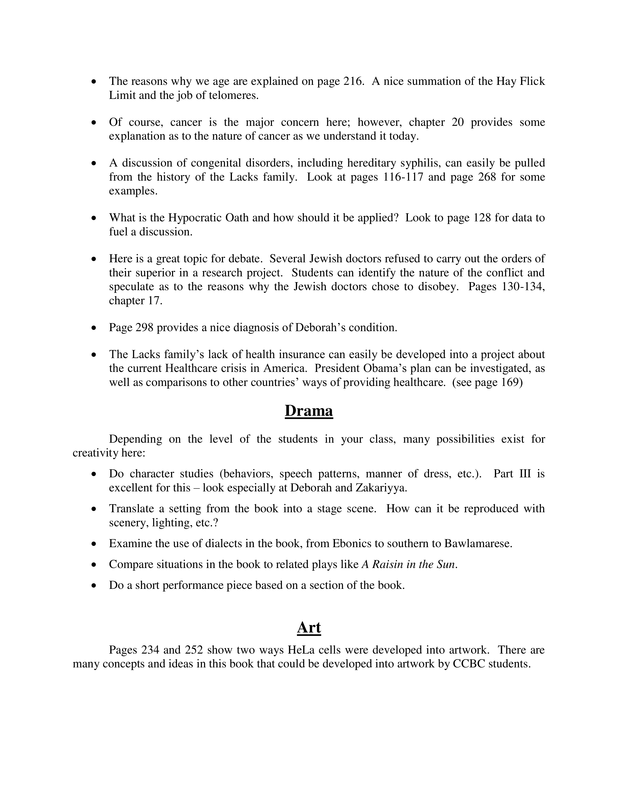 What role did poverty play in the lives of the Lacks family? How does the author juxtapose this poverty with the successes of HeLa? How does the author depict the repercussions of the loss of a parent in the narrative? How do you think Henrietta's life would have differed if her mother had lived? How would Deborah's life have been changed?